however there is a lot of planning and time required to fullfil the job … The PDT solution exist with following scritps: Downloader.ps1 Installer.ps1 VMCreator.ps1 (No editing required here) and following configurable xml files: Variable.xml VariableAD.xml Workflow.xml You can find it here: http://gallery.technet.microsoft.com/PowerShell-Deployment-f20bb605 A word of advice, don’t underestimate the amount of time you will spend on editing, testing and starting over again … editing XML files is cumbersome and error prone job! If your goal is to learn something about Private Cloud deployments, then this is NOT the tool for you (as you will only learn how to prepare the script), if it will be a 1 time deployment and/or you want to learn from it, deploy all SC components manually. as it will take equally much time as preparing the script. 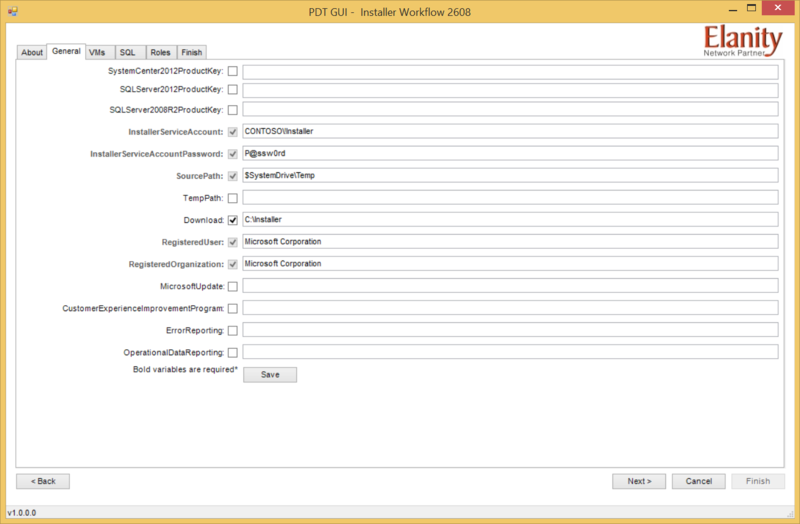 A big timesaver tip would be to leverage the downloader.ps1 from PDT, as this will collect all prerequisites you will need to start deploying the SC components.